Get a headstart on the competition by preparing for your cut-e verbal ability test. Take timed practice tests, track your scores, and ensure you get noticed. Prepare for your cut-e verbal ability test with JobTestPrep today and apply with confidence. Verbal reasoning tests measure your reading comprehension skills. More specifically, they require understanding and analysis of complex verbal information. Understanding how cut-e (Aon)'s tests are different than other verbal reasoning tests is very important. Most verbal reasoning tests include several long passages, with each passage focusing on a different subject and sometimes presenting a certain argument. However, cut-e's texts are more objective, and you are required to handle multiple shorter passages simultaneously. The structure of these tests is unique as well, resembling a typical case study. Numerous short paragraphs are organised in separate tabs so that only one tab is visible at a given moment. The questions follow a true/false/cannot say format. Each question is a statement, and your task is to decide whether it is true, false, or if the provided information is insufficient to arrive at a firm conclusion. To make that decision, you need not only draw precise conclusions from the text, but also figure out which tab contains the relevant information for that particular statement. There are three industry-dependent versions of this assessment: consumer, finance, and industrial. The difference between these versions is not in level of difficulty, but in subject matter only. The finance version, for example, may describe an investment company and present more finance-oriented strategies, whereas the consumer version may be of a retail company and present expanding plans. The texts and questions in all three versions of the test are of the same difficulty level, and none of the tests require any previous knowledge of professional terms. These tests assess your verbal skills as well as your ability to make your way through a relatively large amount of text in a very short time. They are mainly used by cut-e for screening graduates as well as applicants for middle and senior management positions. Common verbal reasoning practice questions may help you exercise your reading comprehension, but they cannot adequately prepare you for the other elements included in these tests. To that end, we have designed an online practice pack that is able to simulate real cut-e verbal reasoning tests. Our pack includes full-length practice tests as well as comprehensive answer explanations and solving tips. We also guide you on how to solve true/false/cannot say questions, how to quickly make your way through the different tabs, and how to shorten the time it takes you to answer questions correctly. Take a look at our cut-e verbal ability pack, and start practising today to improve your score. Unlike the verbal reasoning test, the cut-e verbal interpretation test focuses on finding and using verbal information rather than relying on logical thinking. This test is mainly used by cut-e to screen candidates for administrative and commercial positions. However, the basic features of the test are the same as the verbal reasoning test. Verbal information is presented in short passages organised in separate tabs, and the questions come in the true/false/cannot say format. Your task is to evaluate the validity of each statement, once you have figured out where to find the relevant information. This shorter test assesses your ability to understand simple instructions and messages. It is mainly used by cut-e to screen apprentices and administrative staff. The test is built in the same format as the previously mentioned verbal tests—short paragraphs are organised in separate tabs, so that only one tab is visible at a given moment. Contrary to the other verbal tests, however, answers do not include a 'cannot say' option. 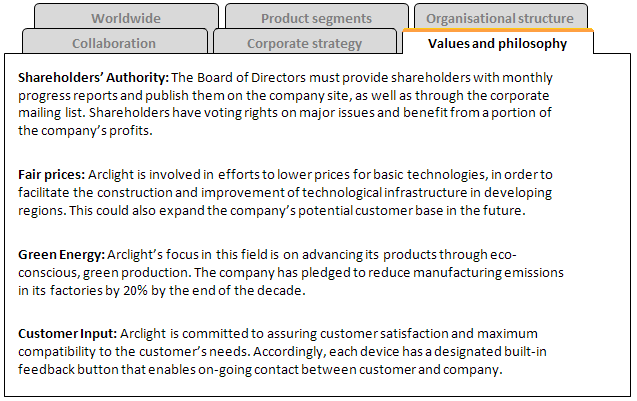 Arclight shareholders are obliged to supply monthly progress reports and publish them on the company's website.